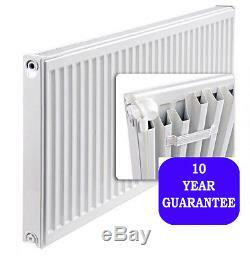 Single Panel Type 11 700mm High x 1600mm Long Central Heating Compact Radiator. 700 high x 1600 long Single Panel. Radiator With Grills and Panels. The radiators are then pressure tested to 13 Bar of pressure to ensure they have no leaks and can fit into any central heating system. The Panel radiators provide high heating efficiency with its wide convector area and optimum pitch width. The radiators come in both single Type 11, double type 21 and 22 designs in a large range of lengths and heights. See table below for range details. For a quote on multiple orders give us a call on the number at the top of the listing. Whats Supplied with this Item. White Double panel central heating radiator. 4 Water connections 2 bottom / 2 top all 1/2bsp. Other Items People Looked At. TRV with Drain off Valve 10 & 8 mm Pipe reducers. Rrier Items up to 30kg. Codes AB, IV, HS, KA27-28, KW, PA20-49, PA60-78, PH17-26, PH30-44, PH49-50, ZE, Northern Ireland, BT. Deliveries to These post codes. Pallet Deliveries Item weighing more than 30kg. Items bought that weigh more than 30kg will be sent by pallet Carrier. The price quoted covers deliveries to Mainland UK only as far North as Glasgow/Edingurgh. You will have to pay before we can resend the items. We strongly advises you not to book your installers or engage in any preparatory work until full receipt of your goods. Our carriers can contact you. As soon as we have delivered the goods to your door you will be responsible for them. We will only deliver to the address on the order and goods will not be left without a signature. Please ensure you check all goods at the point of receipt before signing for them for any damage. Any claim of damages after the package. If you find the product damaged when the carrier is trying to deliver. Inform us immediately and we. Will arrange a replacement for. Any goods that has packaging damaged, or has been installed, or is. If you wish to return an. Or the cost of returning the item. Strongly suggest you return the item using. A trackable and insured means. The order out to you it. Arrives damaged or is incorrect then we will replace it for you free of charge. Deliveries will be sent using a trackable parcel carrier where possible. These items can be sent to all standard UK post codes including Northern Ireland. We strongly advise you do not book any installers or engage in preparatory work until full receipt of your goods. Please note We will only deliver to the address on the order and couriered goods will not be left without a signature. Damages Please ensure you check all goods for any damage at the point of receipt and before signing for them. Any claim of transit damages after the package has been signed for will not be accepted. Goods signed for as goods not checked will also not be accepted. If you find the product damaged when the carrier is trying to deliver, inform us immediately and we will arrange a replacement. We strongly suggest you return the item using a trackable and insured means. If your order arrives damaged or incorrect, we will replace it free of charge. The item "Single Panel Type 11 700mm High x 1600mm Long Central Heating Compact Radiator" is in sale since Wednesday, June 29, 2016.